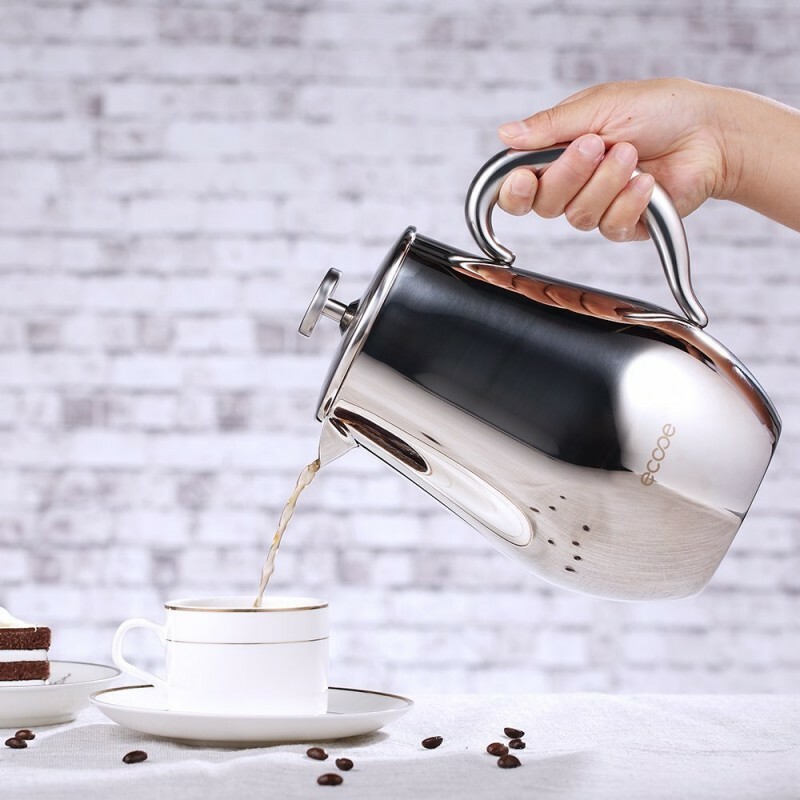 Made of premium stainless steel, the French Press coffee maker is built to last for many years. While the polished surface matches well with any decor. Ultra-dense mesh filters enable you to make perfect French press coffee with ease. It allows the full-bodied flavor flow through yet leaves no coffee grounds while brewing. 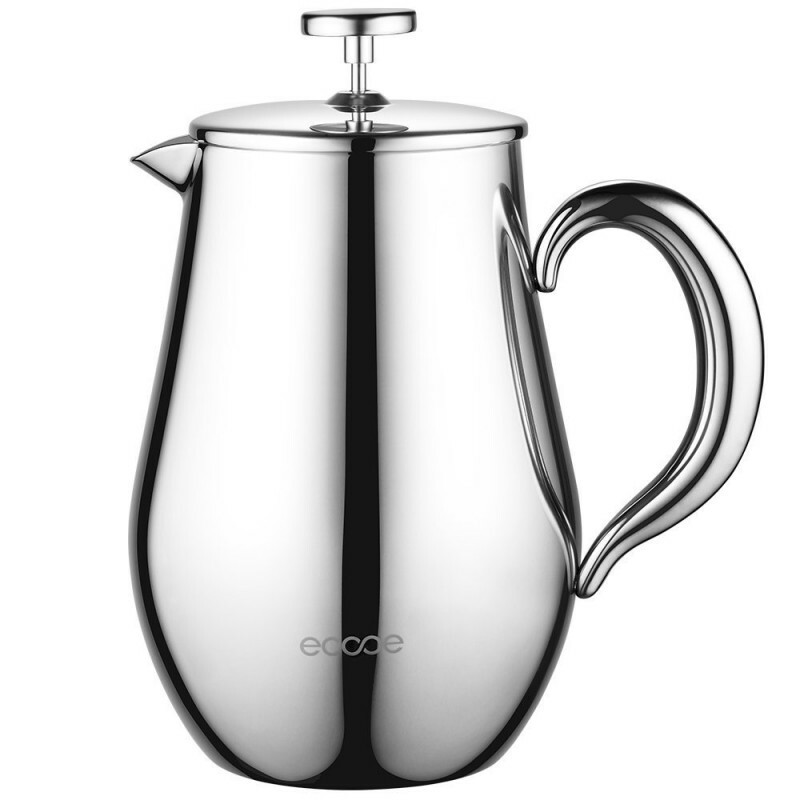 Double wall design spreads the hot slow, which makes it keep coffee hot longer than glass French Press. 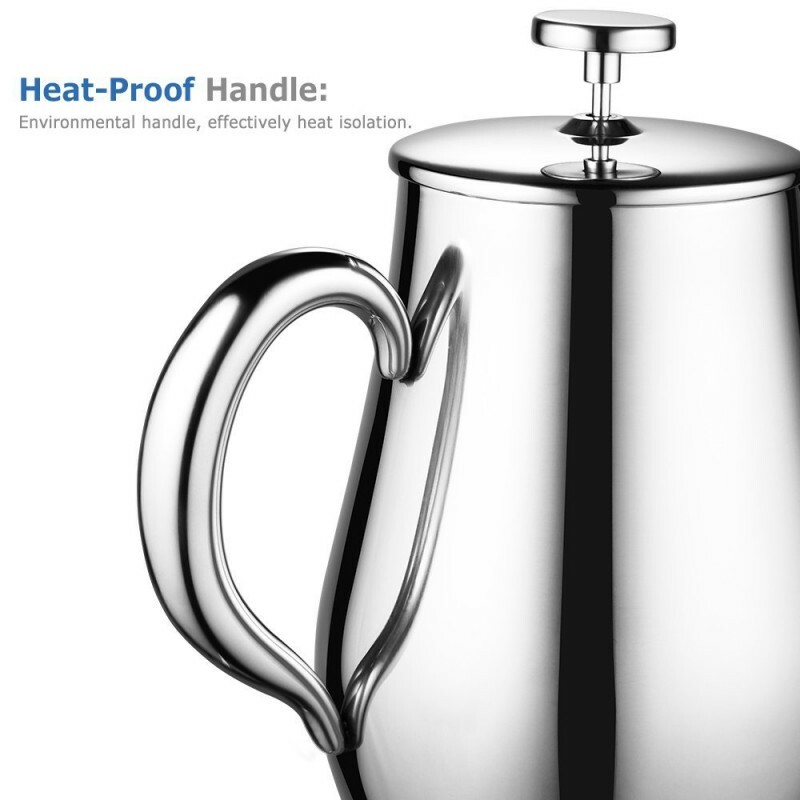 Reinforced handle effectively resists heat when filled with hot coffee. It's very stylish, keeps warm for a while and does what it's meant to do. No complaints. Totally worth its price. Great quality. I've only used once, but so far so good. Definitely keep tea and coffee hot for longer than my glass French press. Excellent coffee (I am grinding manually). I do wish it had come with instructions but those are easy to find online: just Google search for "how to make French Press coffee" and many instructions including videos come up. Best coffee I've ever made. The spout does not close completely when it's "closed" and I actually pour from the "closed" position. Sleek design. Looks great on the counter top and makes a morning cup of coffee feel like an indulgence. Excellent. I love the coffee press! The pot is so sleek and beautifully shaped. I was surprised how easy it is to press down the filter. The coffee tastes like the Brazilian coffee I grew up with- I love it! My only complaint is cleaning the wet grounds out of the bottom of the pot. Not sure if it's OK to just throw the grounds down the sink. I don't have a garbage disposal in the sink. Very pretty, works great. It does not hold temperature well, though. Quality product making excellent coffee. Been using this thing for a month now and it's a dream. Easy to clean up and easy to polish and prevent spots so it looks classy. I love this press. Makes great loose leaf tea which I drink by the pot full most days. The double insulation makes it warming on the outside and boiling hot inside. Looks cool too. Very impressive! Great French Press! Really nice French Press! What can I say - it works like a French Press but it's a really really nice one. Nice screen so you are drinking your coffee through the grounds and keeps it warm for your next cup. Love it! Beautiful and easy to clean. Just what I wanted. 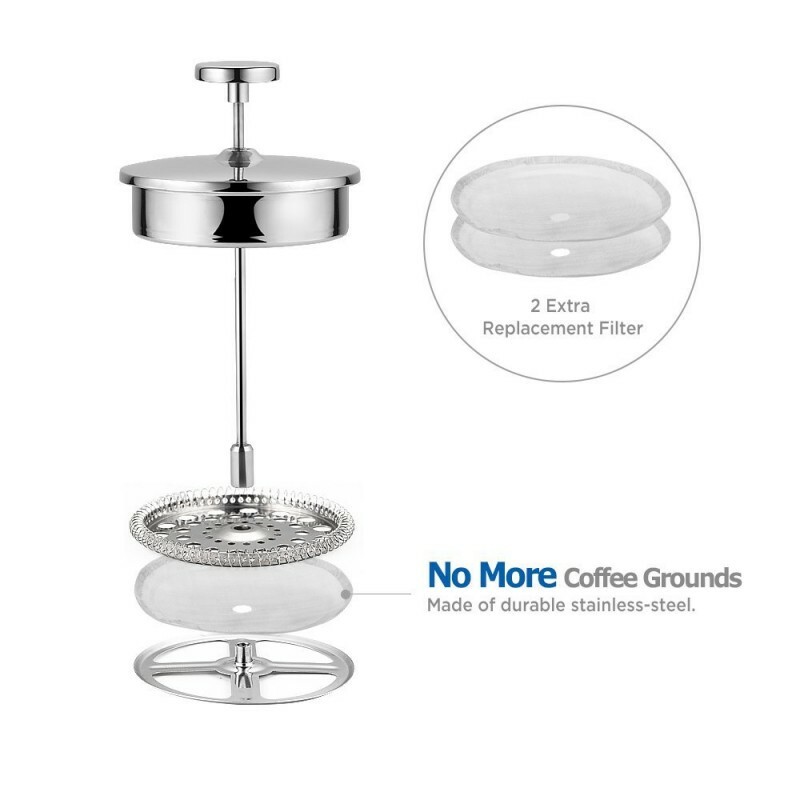 I love this stainless steel coffee press. 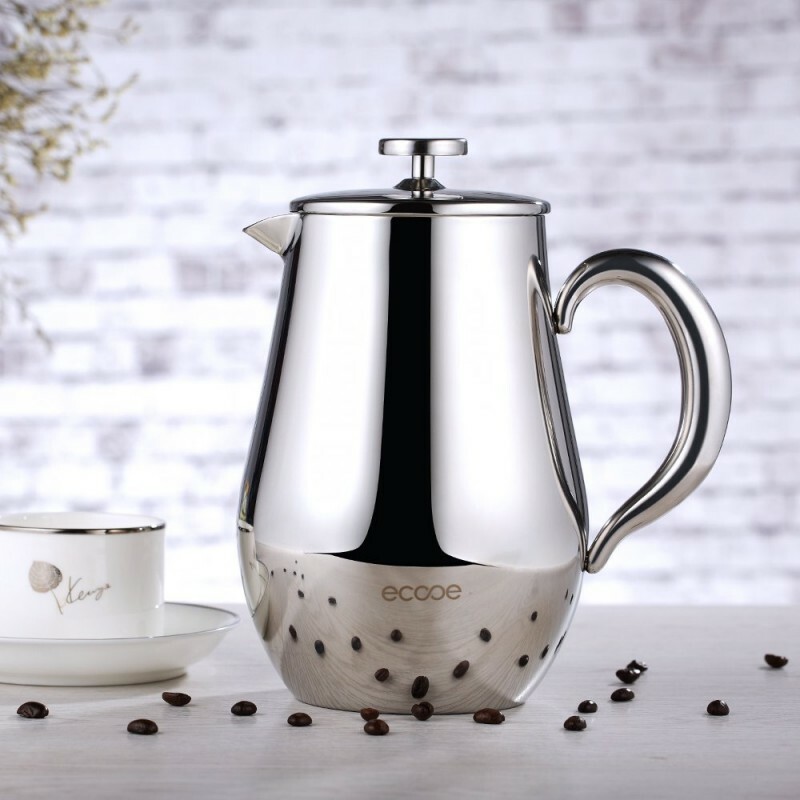 The stainless steel design is perfect and makes me feel better about not using plastic especially since you are adding hot water which can cause chemicals to leak out. It keep the coffee hot for over an hour with this double wall insulated design. Also, no matter how fine your grind the coffee the mesh filter works like a charm and does not get little bits of grounds into your coffee. I am very happy with this product and highly recommend it. 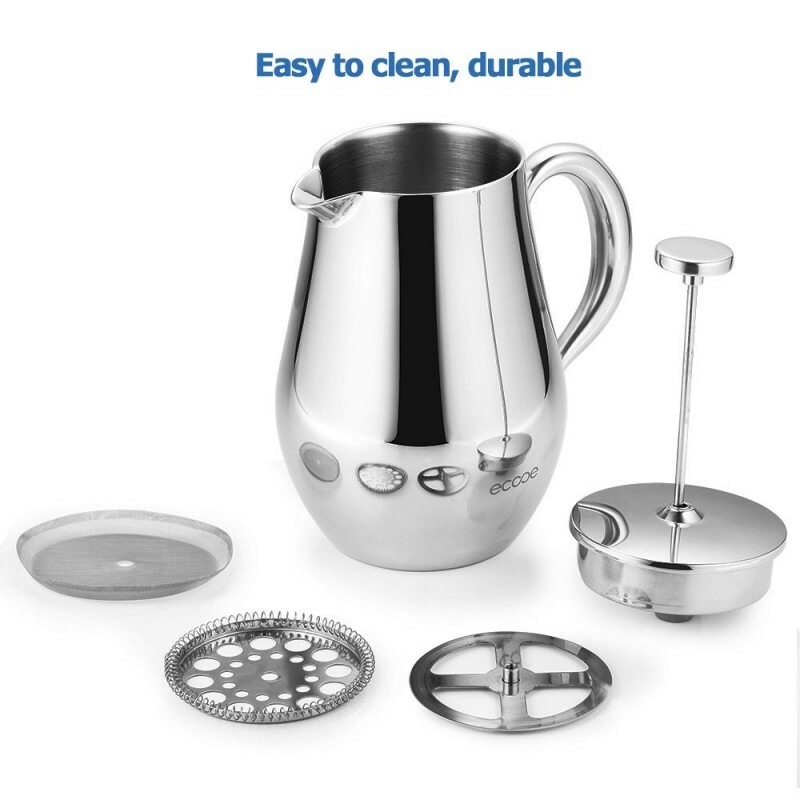 Pros: * Made with stainless steel material with polished finish * Double wall insulated design which help to keep hot drinks longer * Double mesh filters ensure no coffee grounds left and you can make a good tea too * Very easy to clean and dishwasher friendly Cons: * None so far. But will update if anything I received this product at a discount in exchange for an honest unbiased review. These opinions are my own and not persuaded in any way by receiving a discount on this product for review. Reviewed by Gopower If you found my review helpful, please vote 'YES' below. Thank You.